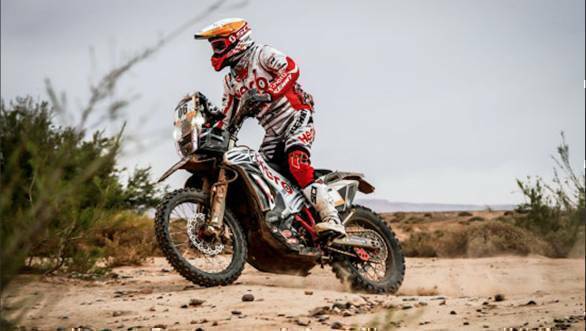 The third stage of the 2019 Merzouga Rally entailed good fortune for one Indian racing team and mixed fortunes for the other Indian racing team competing in the event. While the Hero MotoSports Team Rally outfit did very well, there was bad luck for the Sherco TVS outfit, with Michael Metge retiring from the rally due to issues with his motorcycle. The 229.59km Stage 3 was divided into two parts - 89km and 107km each. 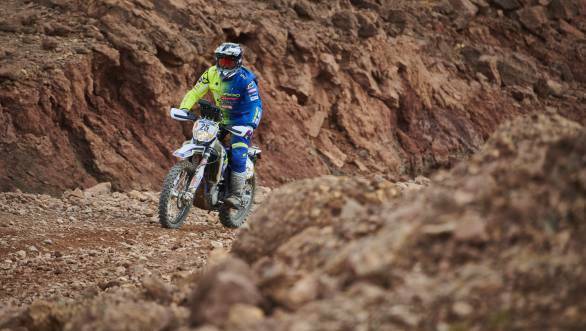 Both involved tricky navigation, and also required the riders to be extremely sharp and focussed to get to the marathon bivouac, where the first part of the marathon stage would, naturally, conclude. The two Hero riders, Joaquim Rodrigues and Oriol Mena had a strong stage, ending second and third overall. Which also put them second and third overall in the rankings with two stages left in the rally. However, it was mixed fortunes for the Sherco TVS squad. Their star rider, Michael Metge, had to retire from the rally facing issues with his motorcycle. This left Aravind KP in the 450 class and Abdul Wahid Tanveer in the Enduro class. Tanveer ended the third stage second in the Enduro class, which put him third overall in the Enduro category at the end of three stages. Aravind ended the stage 32nd, which puts him 62nd overall after three stages of the rally.